How to watch The Lord of the Rings: The Return of the King: Extended Edition (2003) on Netflix Argentina! 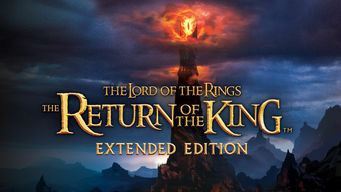 Yes, The Lord of the Rings: The Return of the King: Extended Edition is now available on Argentine Netflix. It arrived for online streaming on October 7, 2017. We'll keep checking Netflix Argentina for The Lord of the Rings: The Return of the King: Extended Edition, and this page will be updated with any changes. Aragorn is revealed as the heir to the ancient kings as he, Gandalf and the other members of the broken fellowship struggle to save Gondor. Two little hobbits risk life and limb to protect a powerful and dangerous ring. A fiery volcano awaits.